Modern luxury villa in Nova Santa Ponsa in an excelent location. The villa in Nova Santa Ponsa on a 1.270 sqm plot was built in 2011 and benefits from a large pool and summer kitchen with BBQ. The 414 sqm living area itself splits in a spacious lounge with fireplace and access to the terrace and the garden, separate kitchen (equipped Bosch), 4 bedrooms, 3 modern bathrooms (2 en-suite), utility room, guest toilet and a garage. From the 60 sqm large roof terrace with Jacuzzi you can enjoy outstanding panoramic and sea views. 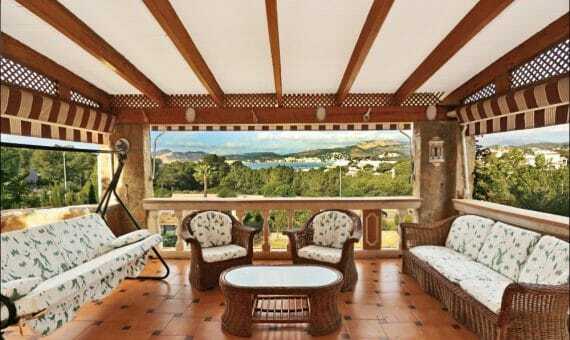 Furthermore profits the Villa in Santa Ponsa from air condition h/c and oil central heating. Perfectly located close to the sea, beaches, restaurants, bars and supermarkets.